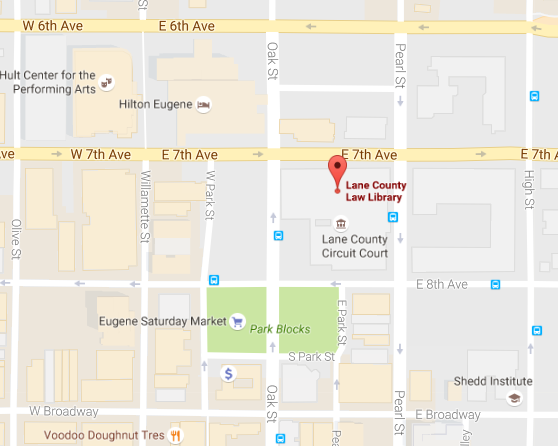 The library is located in the basement of the Lane County Public Service Building at 125 East 8th Avenue. We are across the hall from Jury Assembly and the cafeteria. You do not need to go through court security to visit the library. The library is open from 8:00 a.m. to 5:00 p.m. Monday through Friday. Staff are typically unavailable over the 12:00 - 1:00 lunch hour, unless otherwise arranged in advance. The library may be unstaffed for appointments, meetings, and time off depending on availability of backup staff. Advance notice will be posted whenever possible. What books are available at the library? We have a library catalog with thousands of titles from a variety of legal publishers, but our library staff will be happy to help you find the two or three most fitting to your question. *​Practical Oregon materials from the Oregon State Bar, Oregon Criminal Defense Lawyers Association, and continuing legal education program materials. *Past and present Oregon laws and legislative history resources, and United State Code and Regulations. *Treatises, legal dictionaries, form books, and legal encyclopedias. *Self-help law books from Nolo and National Consumer Law Center (NCLC). What resources are on your public computers? *Westlaw - cases, statutes, Keyciting (case validation), and some secondary materials. *HeinOnline - law review articles, federal legislative history, and historic legal materials. *BarBooks - attorney practice guides and deskbooks published by the Oregon State Bar. In addition, Microsoft Word is installed on public computers, for drafting court documents. Can I copy, call, fax, or print in your library? Yes, all of the above. The library has a public phone (local calls only). We also have copy, printing, and faxing services available for current county rates. What else can I do at the library? The library strives to be a quiet space to conduct legal research, prepare for court, or meet with others in the meeting room, which can be reserved in advance.